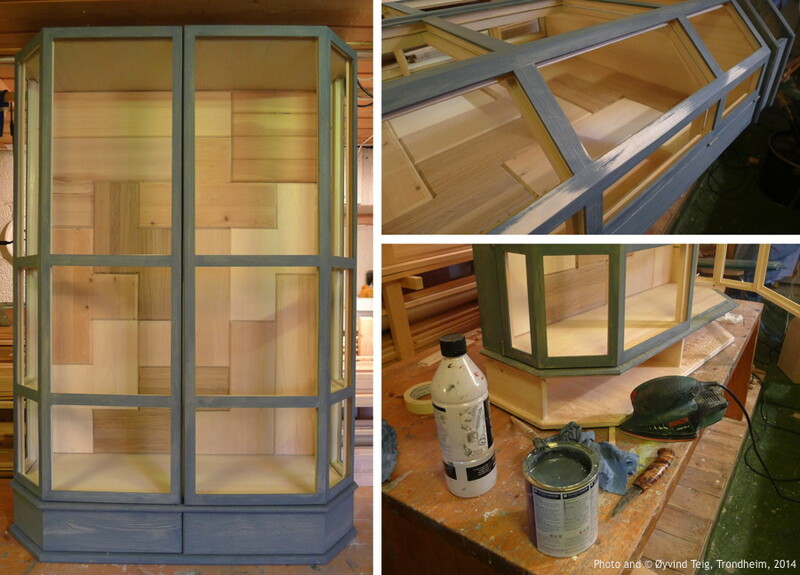 When I started with this cabinet I thought it was going to be a follow-up from the Wall-cabinet with curved corners. Despite the strong similarities it didn’t. As always there is a dialogue between the prospective owners of the furniture and me. This time the size 80 x 115 x 28 cm was given. (Well, almost: we had to go from 120 cm height to 115 because of the height from my work table to the roof; and it was too wide to comfortably build it laying down.) They wanted 45 degrees corners. 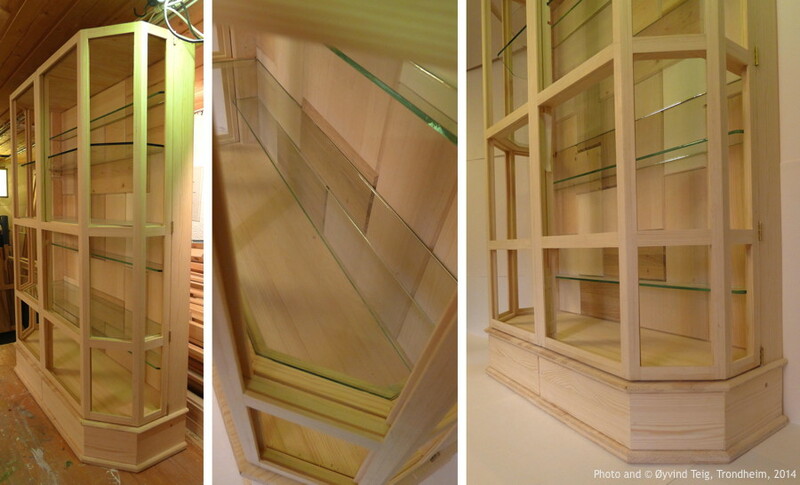 It should have the function of a display case, showcase, display cabinet or vitrine – choose any name you like. Since the doors were to carry weight at 90 degrees and then could easily twist when they opened I thought I should avoid joints by cuts that made the structure non-symmetric. The moment was also larger than on the previous cabinet since this is wider as well as have a longer short side; here there also is glass after the corner. Therefore I did like the rounded corner cabinet: I used list after list and laminated the whole structure like, I imagine: an airplane wing? Above you see all the horizontal parts, each consisting of 3×3 lists of 4×12 mm. My local shop (Hobby Shop in Trondheim) was out of them, so I found a company in Sweden (MBS RC Models) that had nice pine lists. 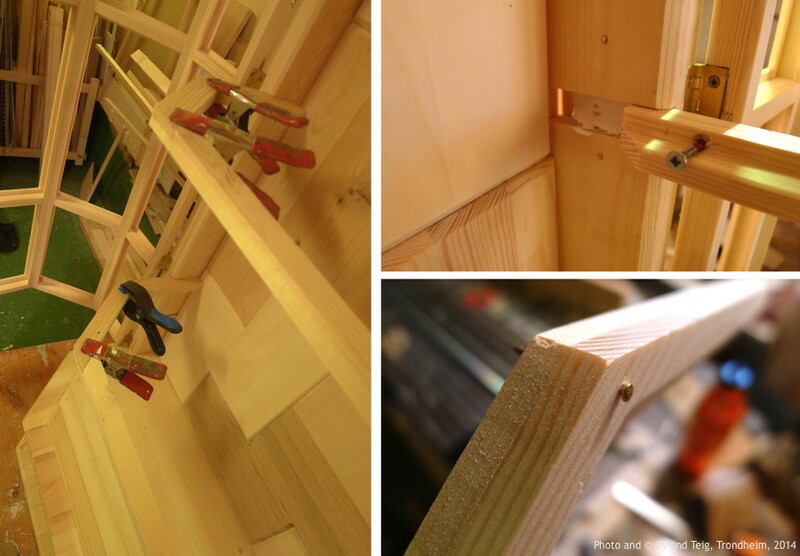 Above I glue the doors with vertical lists, mostly 4×12 mm, but also 12×12 inside. I also added covering horizontal lists. But some of the vertical list I cut down from 4×12 to 4×7 mm with a small Minicraft 100 W, 12 V circular saw that I had bought in the UK in the nineties without ever having used it. Now I had a good reason to buy a real power for it; I found it on the web (Rapid SPS-9250, 3-15 V, 25 A). It brought the saw into smooth operation. The wood double vertical pieces just looked too wide built with two 12 mm lists beside each other, so I made them 12 and 7 mm instead. This was particularly important in the centre, where the two doors meet. It took the centre’s width down from 48 to 38 mm. On most old cabinets of this type that I have seen, one or two of the horizontal decorative lists have fallen off. Since I have a perspective of a hundred years life time (and if it survives that long, who knows?) 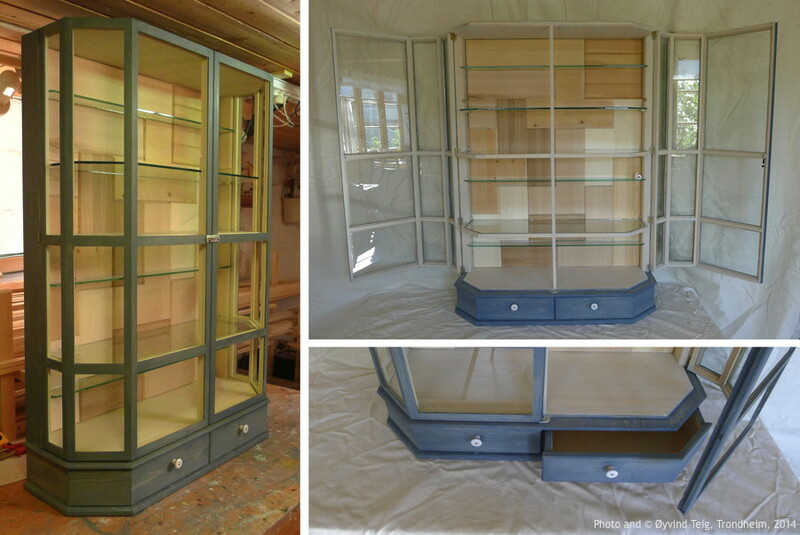 I decided that this was not the way that this cabinet should be degraded and fall out of interest. So I decided to make the decorative list not by using decorative list, but let it but part of the floorboards proper. I glued these floorboards (bottom, above drawers and the invisible top) of 6 mm pine lists, laminated in three layers with the centre layer at 90 deg. In the lowest floorboard the top layer is in-out with the drawers’ sliding direction, but the top of the next is along the width to make it look wider. It turned out that this was difficult, I noticed some tiny cracks when it dried. I let them be, since anything I would fill in there probably would fall out before 2114 and make it worse. But I didn’t want to use veneer, as I think that the most critical time for a furniture is when it’s moved. And veneer with raggy edges is not very nice. 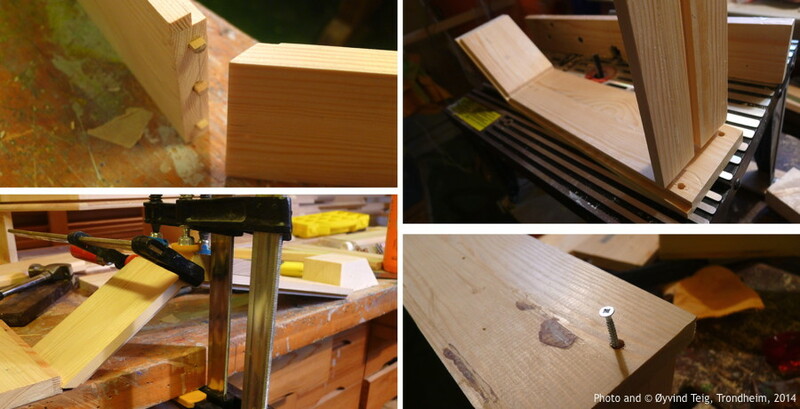 There also is a structural reason for the felling of the sides into the floorboards. 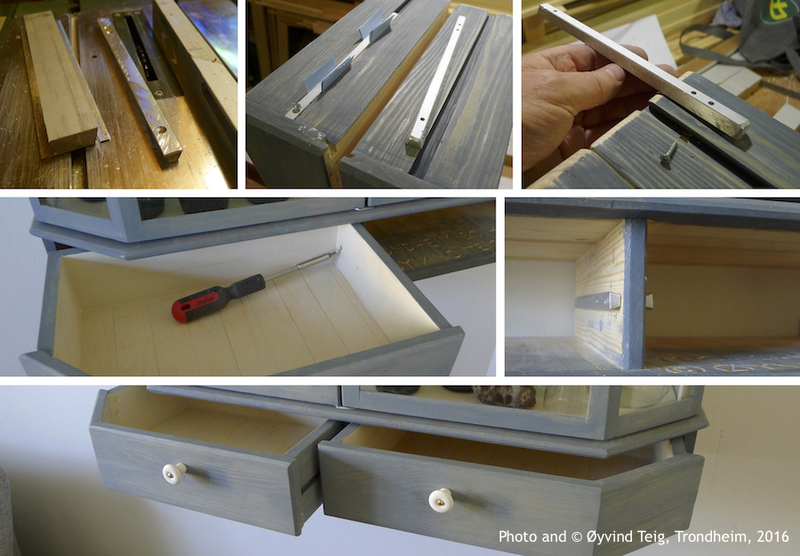 It made it possible to bind it with the sides (close to the drawers) with glue and a plug so that the cabinet is able to stand when empty. The static forces will in that case also go up/downwards in the centre list behind the doors and into the two wooden shelves and even into the top, which also is joined and glued and held with hidden screws (below). Of course, this also hinders the cabinet from sagging over the next decennia. I had agreed with the prospective owners to make the back part appear like a Tetris game. This game originally has 7 different pieces – so we decided that the back should have the same. Seven different types of Scandinavian wood. And some could have a history, like from an old loom that mother used etc. But my main worry was how to make these, and not the least how to fasten them without having them crack for a hundred years? They are not only square or rectangular, but the other five even have “internal corners”, not good for future expansion during summer (when it’s rather humid) and winter (when it’s rather dry). Here we can watch any wood extract during summer and contract at winter. Since each Tetris piece is built from four (=tetra) squares, I decided that this needed to be the basis of my grid too. I decided to screw them lightly into a square frame and use no glue. So I made the pieces and then cut out space for the frame on the rear side of them. I didn’t want them to look too thick, but I did want to build them rather thick. Should the crack-free design fail it is now possible to screw them out and repair. You can see some of the screws on the back side on the last picture below. The screws are small, but it is meant that they should keep the pieces from bending. The grid is 6 by 8 and I wondered if Tetris could be complete with no holes in that grid. I made some paper pieces and soon found myself having puzzled five complete boards (so it can’t be NP-complete?). One of them was decided on; it consists of 12 pieces, so five of them are doubled and none tripled. I used brass nails in all the corners of the doors (above), and just bent them on the inside. This sound ugly I guess, but it looks ok. It was a point that the Tetris back shall not be covered by anything but glass. So, for the two shelves I made a frame in front. The 6 mm glass is pushed down into it, with a groove in the vertical bar in front and two small mm-boxes screwed in the sides. None of the glass will fall out if the cabinet is carried, turned any way around. 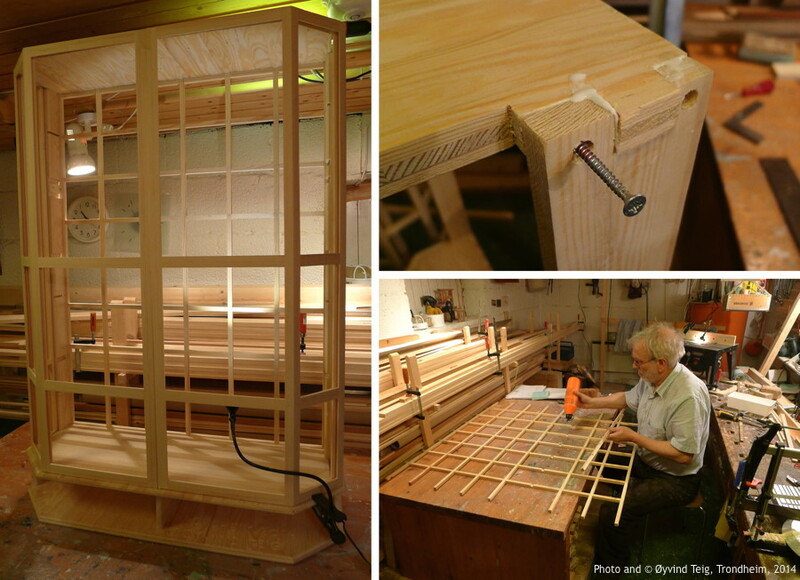 The shallow glass-only shelves are tightly pushed into the frame, so even they will sit firmly by friction. The two drawers were harder than I thought since there were two difficult angles in each. I used butts and inside screws in pocket holes to make them strong. You can see some of the process above. Also, the two had to be equal. Above are some last pictures before I started painting. I painted the exterior blue/gray and the interior white, but for both I removed the oil based paint after some time with a cloth. The Tetris back is of course not painted. I think that this procedure is more work than just to paint. The reason is the glue that I never seem to have removed enough of. I then have to sand down both the paint (wet or dry) and get away with the glue as well. Then more paint. This is not visible even if I do it the day after, since the whole structure of the paint is rather coarse. 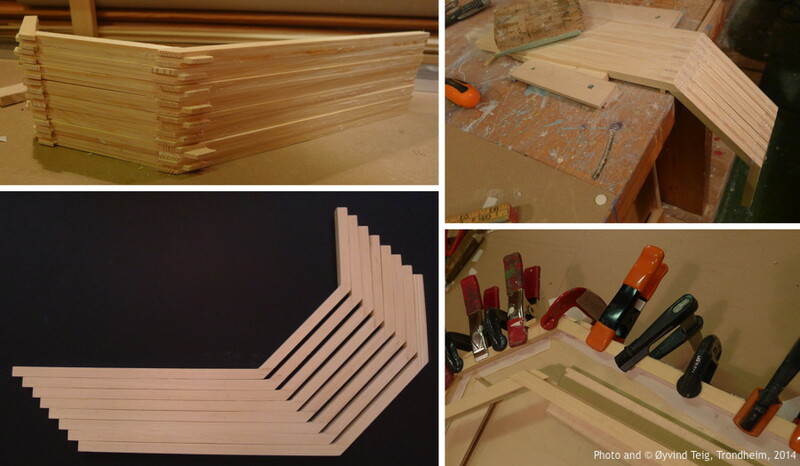 It’s even ok if I repeat it on the same segments of wood. The lock I made from some extruded aluminum that I had found in the metal container at work. I had bought some 1/4″ Professional 36pc Letter & Number Stamp Punch Set – 6mm Hardened Steel – Metal, Wood, Leather from JR Quality Tools on Amazon. These were not good enough since the letters and numbers were not aligned equally and at odd angles, and then it’s almost impossible to get much other result than you may see. But I thought it rather charming, so it’s ok this time. Above you can also see the aluminum “shelf” that the doors are meant to be lightly pushed onto. This is to avoid the doors sagging down after some time. There is one shelf that is 6 mm glass only, since it should be possible to position it at different heights. However, it is not space enough. I wanted the three pieces of glass that make up the three shelves exactly equal. Two are inside a frame, and this one isn’t. I thought about this for days until I came up with the solution you see above. To move it up then pull the two locking wooden lists on each side towards you and let the glass loose, from them and from the front groove. Then position it in the front groove above and push the locks into the higher side grooves. Voila! If this is a world’s first and you want to use it, then please credit me! If not, I haven’t found it on the web, so I won’t know what to do. The wood weights 20 kg and the glass 15 kg. Each door is 3.5 kg with glass. 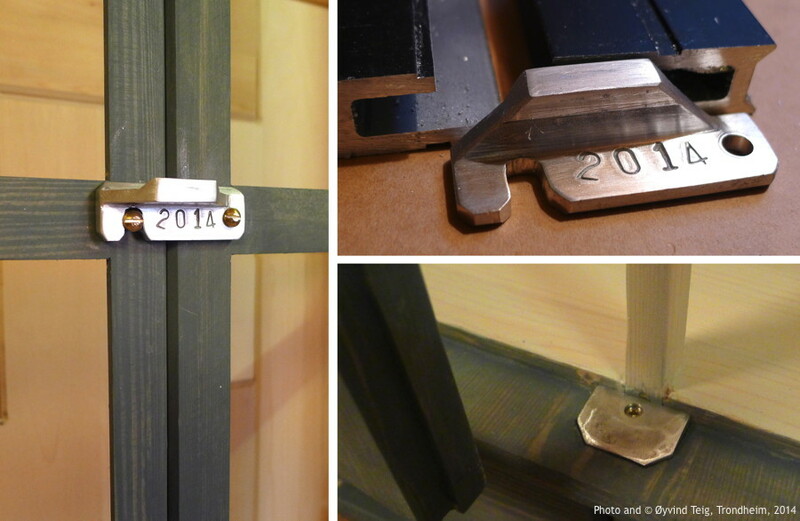 I used two sturdy metal plates to hang the cabinet on the wall (Simpson Strong-Tie NP15/60/140-R 1.4mm NailPlate) . It must be lifted down onto the wall screws, and pushed up from them as well. The metal plates are fastened onto the cabinet with three 6 mm metal screws, screwed into 6 mm holes. I also made the larger hole with an 8.5 mm groove on the top for the wall screw, I think it’s called keyhole mounting for maximum 8 mm wall screws. I did not want to use wood screws for fear of cracking the wood in the sides. I used a little silicon to help with the small pull that might be in the holes. So they may be unscrewed. I guess almost all moment will consist of shear forces in the holes. But I still used some tiny wood screws to hold the metal sheets in position. After a couple of years’ use the owners decided to tell me that the drawers were too easy to lock-stop (is that the right word?) when they were pushed in. I had made masks in the drawers, but I thought we should wait and see. So I took some aluminum (I always have some of random sizes, picked up from the waste metal container at work) and made two sliders. The blade on my FET saw should be ok handling aluminum. However, since it was new to me it jammed twice, it lost a tooth and the driving belt went off twice, and I had to fasten two screws. This hit my aluminum-handling limit but probably also the Proxxon saw’s limit. Next time I must be more careful. Easy, easy.. The next problem was to find the right height to screw them into the cabinet. I drilled a hole in the rear of the drawers that was big enough for the screw to be inserted that way. 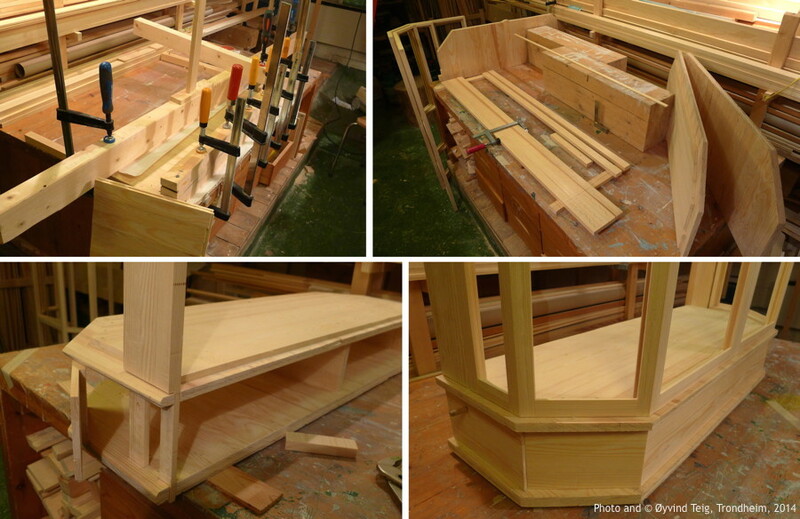 Then I fastened the front part with the drawer almost fully out. I used two pieces of paper to position the aluminum sliders inside the groove. The inner part of the slider was more difficult, but I had made them quite loose so I hit on first trials. The holes in the sliders must overlap so that the screws from each side won’t touch each other or open the wood too much. I had two screws in the front and one inner screw. The drawers are still able to lock-stop, but they won’t position wrongly so easily. Also, if the owners now learn to push the handle into the middle, just a little, then I saw that it certainly helps. I am anxious to see how it goes. I have estimated the time spent on this cabinet to some 200 hours. And of course, it’s thoroughly signed with cut letters, seen when a drawer is opened. Maybe it will help the cabinet survive, when they see my name, place and 2014 in it? Some time this will be a long time ago. I have also stamped all the glass measures into a piece of aluminum that’s fastened to the back of a drawer. The door glass is 3 mm thick. By the way, the wood in the Tetris pieces are spruce, birch, aspen, beech, oak, light pine and dark pine from a 130 year old loom that’s had its wood reused for other purposes. Please help me with the English terms here, I’m not a woodwork-English specialist! Om du likte det, se forrige skap der.